Bluetooth speakers are ten a penny these days. Hell, some companies even give them out as promotional goodies, they're so ubiquitous. So in a market like that, how do you make your latest gadget stand out. Well, it looks like the answer to that question is to make it levitate. Yes. You read that right. Levitate. 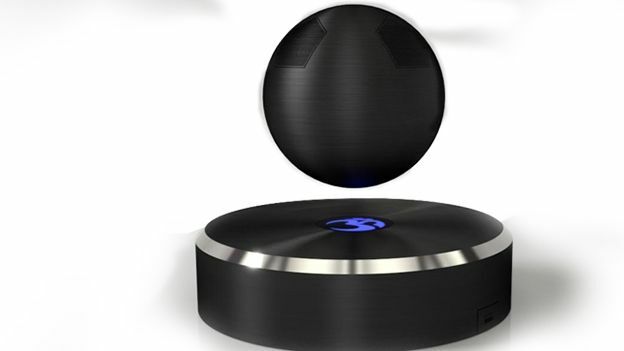 The Om/One is a gravity defying Bluetooth speaker that levitates about its base thanks to a clever use of electromagnets. The clever base also charges the device, with Om Audio claiming the final product's battery life should be somewhere in the region of 15 hours. The company is currently trying to raise a round of funds via crowdfunding. he campaign launched earlier this week. It's already nearly tripled its original goal of $100,000. At the time of publishing, Om Audio had raised more than $264,350 from 1,134 backers. The Om/One will be available in three colours: basic black, basic white and perhaps the most interesting of all, disco ball. The latter will cost you a little bit more, but lets face it. Even though disco died decades ago, nothing says cool than a disco ball. Combine that with levitation and well, you can see where we're going. The company is hoping to have it ready in time for Christmas. There's no word on whether it will be making its way across this side of the Atlantic.